Rocks sit above the surface of the water off the shores of the town of L'Anse aux Meadows in Newfoundland, Canada but none are as big as the large rocky island. A layer of soft clouds fill the sky over the island as the rays from the sun still manage to burn through some areas as sunset nears an end. A jagged rocky island off shore from the town of L'Anse aux Meadows, Northern Peninsula, Great Northern Peninsula, Viking Trail, Trails to the Vikings, Newfoundland, Newfoundland Labrador, Canada. 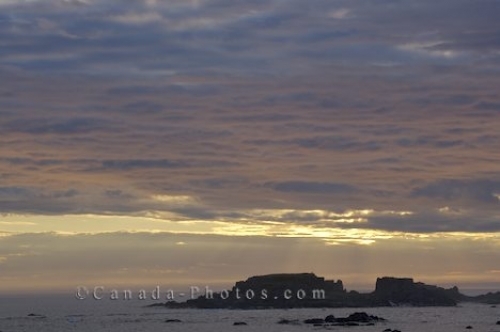 Picture of a soft colored sunset above a rocky island off the shores of L Anse aux Meadows in Newfoundland Labrador.